Your budget, or spending plan, isn’t set in stone—it needs to change along with your income, expenses and goals. Software and online tools allow you to revise your numbers quickly and easily. Don’t forget that savings should always be an “essential” expense in your budget. If your income goes up, put at least half your raise toward savings. If you have debt other than a mortgage, earmark any windfall (a tax refund or bonus, for example) for paying it off. If you can’t make ends meet because you have too much debt, a credit counselor may be able to help you reduce your monthly payments through an agency-administered debt management plan. To find an accredited non-profit agency, contact the National Foundation for Credit Counseling at NFCC.org or 800-388-2227. If you are receiving calls from collectors, don’t ignore them. Doing so could allow the collector to get a “default judgment” against you and garnish your wages or seize your assets. 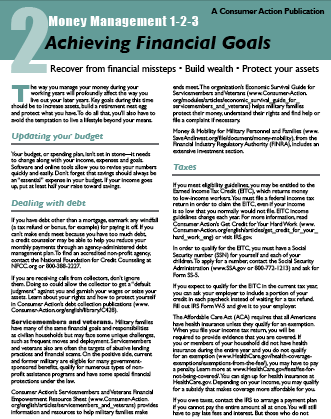 Learn about your rights and how to protect yourself in Consumer Action’s debt collection publications. Military families have many of the same financial goals and responsibilities as civilian households but may face some unique challenges, such as frequent moves and deployment. Servicemembers and veterans also are often the targets of abusive lending practices and financial scams. On the positive side, current and former military are eligible for many government-sponsored benefits, qualify for numerous types of non-profit assistance programs and have some special financial protections under the law. Consumer Action’s Servicemembers and Veterans Financial Empowerment Resource Sheet provides information and resources to help military families make ends meet. The organization’s Economic Survival Guide for Servicemembers and Veterans helps military families protect their money, understand their rights and find help or file a complaint if necessary. Money & Mobility for Military Personnel and Families, from the Financial Industry Regulatory Authority (FINRA), includes an extensive investment section. If you meet eligibility guidelines, you may be entitled to the Earned Income Tax Credit (EITC), which returns money to low-income workers. You must file a federal income tax return in order to claim the EITC, even if your income is so low that you normally would not file. EITC income guidelines change each year. For more information, read Consumer Action’s Get Credit for Your Hard Work or visit the IRS website. In order to qualify for the EITC, you must have a Social Security number (SSN) for yourself and each of your children. To apply for a number, contact the Social Security Administration (800-772-1213) and ask for Form SS-5. If you expect to qualify for the EITC in the current tax year, you can ask your employer to include a portion of your credit in each paycheck instead of waiting for a tax refund. Fill out IRS Form W-5 and give it to your employer. The Affordable Care Act (ACA) requires that all Americans have health insurance unless they qualify for an exemption. When you file your income tax return, you will be required to provide evidence that you are covered. If you or members of your household did not have health insurance during the entire year and you do not qualify for an exemption, you may have to pay a penalty. Learn more at HealthCare.gov. You can also sign up for health insurance at HealthCare.gov. Depending on your income, you may qualify for a subsidy that makes coverage more affordable for you. If you owe taxes, contact the IRS to arrange a payment plan if you cannot pay the entire amount all at once. You will still have to pay late fees and interest. But those who do not make arrangements with the IRS risk having their wages garnished, having a tax lien filed against them or having valuables and assets seized. If your tax problem is causing financial difficulty or has not been resolved through normal channels, contact the Taxpayer Advocate Service online or at 877-777-4778. There are strategies for making saving easier. One of the best is to set up an automatic transfer from your checking account to your savings account every payday. If you never see the money, you won’t miss it. Save as early and as consistently as possible, even if it’s only a little each week or month. Thanks to compound interest, someone who saves smaller amounts early in life can end up with more money than someone who saves larger amounts later in life. Take advantage of employer-sponsored retirement savings plans such as a 401(k) or 403(b). The money comes out of your check before taxes are calculated, so the reduction in your paycheck will be smaller than the amount you contribute. Many employers also match employee contributions up to a limit—free money for you! A traditional IRA provides a tax break on contributions for qualified savers. Taxes are paid only on withdrawals (called “distributions”), which must begin by age 70½. Contributions to a Roth IRA are made with after-tax dollars, but withdrawals are tax-free (including accrued account earnings). You can contribute indefinitely, and there are no distribution requirements. Get IRS Publication 590-A for the latest IRA rules, income limits and exceptions. Although most experts recommend saving for retirement rather than college if resources are very limited, it's a good idea to learn about state-sponsored 529 college savings plans and other college savings options. A good place to start is Consumer Reports’ Parents’ Guide to Saving for College. As you decide where to put your money, keep timing in mind. Funds that you may need soon or suddenly, such as the money in your emergency fund, should be in a liquid (quickly accessible) account. These include savings accounts, money market accounts and possibly short-term certificates of deposit (CDs). Such accounts typically earn very little interest, but your goal here is safety and liquidity rather than growth. CDs earn higher interest than savings accounts, but you must commit to leaving your money in the account for a specified period. The longer the term, the higher the interest rate. Very short-term CDs—the kind that might be appropriate for an emergency fund—pay very little interest. If you withdraw the money early, you’ll pay a penalty. Visit Bankrate.com to compare interest rates. Your deposit accounts at any FDIC-insured bank and at all federal credit unions are insured up to $250,000 per depositor per account type. Learn more about FDIC insurance and find out which institutions are covered at FDIC.gov. Credit union members can visit MyCreditUnion.gov for similar information. U.S. savings bonds are guaranteed by the government and can be purchased online in denominations ranging from $50 to $10,000. When you buy a savings bond, you loan the amount you paid for the bond to the federal government. Over time (up to 30 years), the savings bond earns interest. After 12 months, you can cash in the bond for its face value plus the interest it has earned. You may qualify for tax savings on bonds used to pay for education. For more information, visit SavingsBonds.gov. Individual development accounts (IDAs) help low-income families save for education or job training, to buy a home or to start a business. Visit Prosperitynow website to find local programs. Choose to Save offers advice on saving for college, a home and retirement. If you are on public assistance, ask your benefits counselor how much you can save without jeopardizing your benefits. When you invest, you accept some risk in exchange for the opportunity for greater rewards. Generally speaking, as the opportunity for higher returns increases, so does the risk of losing some or all of your money. While it might seem tempting to avoid all risk, you will need your savings to grow at a rate that far outpaces inflation if you want it to last you a lifetime. That is not possible with savings accounts, savings bonds and CDs. The key is understanding and managing your risk. Whether you save for retirement through your employer or on your own, you will have to make investment choices. The Securities & Exchange Commission’s (SEC) investor website is a good place to start learning about investing, as is FINRA’s site. Investing for Dummies, by Eric Tyson, is a reader-friendly beginner’s guide to investing. Generally speaking, the longer your investment timeframe and the more you diversify (spread out) your investments, the lower your risk. In other words, investing in 20 different stocks for 20 years is less risky than investing in one single stock for one year. Many individuals achieve diversification by investing in mutual funds. Mutual funds are portfolios of stocks, bonds and other securities in which the public can buy shares. Each investor shares in the fund’s gains, losses and expenses. You can lose money in mutual funds, too, but they are generally much safer than individual stocks. When choosing a mutual fund, look for one that has good long-term performance, charges no “load” (fee) to purchase and keeps annual management and miscellaneous fees to a minimum. Learn more in the Wall Street Journal’s How to Buy a Mutual Fund and the SEC’s An Introduction to Mutual Funds. Many individuals invest in mutual funds either directly with the fund or through a brokerage account they open with a company such as Charles Schwab, T.D. Ameritrade or Fidelity. Many mutual funds allow you to invest as little as $50 per month automatically through scheduled transfers from your bank account. If you choose to hire a financial adviser, be aware that many earn a commission from the investments you purchase, regardless of whether or not those investments do well. There are also fee-only advisers, who provide advice but do not profit off the purchase of investments. FINRA describes what to expect when you open a brokerage account, explains the difference between different types of investment professionals and lets you check out a broker before you hire. Consumer Reports offers a free online Brokerage Services Buying Guide. In the U.S., the greatest source of wealth for most households is the value of their homes. In addition to building equity (ownership) in their property, homeowners benefit from valuable tax breaks that make buying a home more affordable. The cost of owning a home includes the monthly mortgage payment, property taxes, insurance, repairs and maintenance. You’ll also need to save up a downpayment before you can qualify for a home loan. Renting typically entails less upfront cash (a security deposit and first and last months’ rent, but no downpayment or closing costs), offers greater freedom to move around and allows you to avoid the cost of repairs, maintenance and property taxes. However, you lack the freedom to do what you want with the property, you don’t build equity or benefit from major homeownership-related tax deductions and you always run the risk of having to move out. If you don’t already own a home, consider buying one if you can comfortably afford it, and if you don’t plan to move within the next five years or so. Learn more by enrolling in a first-time homebuyers class. To find one, contact the Department of Housing and Urban Development (HUD) online or at 800-569-4287. A mortgage is a loan used to purchase real estate. If you do not repay the loan as promised, the lender can foreclose on, or repossess, the property. There are fixed-rate mortgages, where the interest rate and monthly payment stay the same for the length of the loan. And there are adjustable-rate mortgages (ARMs), which may be more affordable for first-time homebuyers because they start out with a lower introductory rate and payment. Before choosing an adjustable-rate (or variable-rate) loan, find out how high the interest rate and payment could go, and be sure you can afford the increase. A mortgage can last any length of time, but 15 years and 30 years are most common. Banks, credit unions, mortgage companies and other institutions make mortgage loans. There are also some government agencies, such as the Veterans Administration (VA) and the Federal Housing Administration (FHA), that offer special loan programs that may be easier to qualify for. Many factors influence a lender’s decision to approve or decline your mortgage application. But in general, the more you have saved for the downpayment, the less debt you have and the higher your credit score, the more likely you are to get the loan. Learn more at HUD.gov. Protecting your equity and avoiding foreclosure. Many homeowners eventually refinance their mortgage or take out a home equity loan (second mortgage) to take advantage of lower interest rates, shorten the repayment period, lengthen the repayment period (and reduce monthly payments) or tap the equity in their home. In either case, compare loans carefully, and watch out for loans that contain unfavorable terms (a prepayment penalty, for example) or low initial payments that jump to unaffordable levels. Check loan rates at Bankrate.com, and borrow only from a reputable lender. While a low-cost home equity loan or line of credit can be a good financial choice, there are risks. If you can’t repay the loan as promised, you could lose your home. A home equity line of credit (HELOC) can be particularly risky because it functions like a credit card with a very high limit. At the first sign you might miss a mortgage payment, contact a housing counseling agency for help avoiding foreclosure. Find an agency through HUD online or at 800-569-4287. Auto insurance: This coverage protects you and others from financial loss as the result of an accident, theft or other peril. Forty-nine states require drivers to carry a minimum amount of liability insurance. If you have an auto loan, the lender may also require collision and comprehensive coverage. Homeowners insurance: Homeowners insurance covers damage to your home and possessions, and your liability if anyone is injured on your property. Coverage for damage caused by a flood or earthquake typically must be purchased separately. Health insurance: If you do not have coverage through an employer or a government program, you must obtain it on your own. Under the Affordable Care Act, you may be eligible for a subsidy that makes coverage more affordable. Visit HealthCare.gov for more information. Disability insurance: This insurance replaces a percentage of your income if you are unable to work due to an illness or accident. There is short-term disability and long-term disability insurance. If your employer doesn’t offer coverage, consider purchasing an individual long-term disability policy. Life insurance: If anyone (a spouse, partner, children or parents, for example) depends on you for financial support, then you should consider buying life insurance, which pays money (a “death benefit”) to your beneficiaries when you die. There is term and cash-value (also known as “whole life,” or permanent) insurance. Term is less expensive, while cash-value includes an investment component. How much of which types of insurance is needed varies from person to person. You can buy insurance from: an insurer that sells directly to consumers via phone or the Internet; an insurance company agent; an independent broker; and websites that sell policies for multiple insurers or that connect customers who request a quote online with participating agents. Shop around—the difference in coverage and price (premiums) among insurers can be hundreds of dollars. Learn more about insurance by visiting the Insurance Information Institute online or Consumer Action’s Insurance Education site.